For many of us, Labor Day weekend means Summer’s end is near. The kiddos are getting ready for their first day back to school. High School football and all things Autumn are starting to be in full swing. So if you are anything like us, this three-day weekend gives us one last chance to celebrate! This time of year is also known as “Family Portrait Season”. Many of our clients, new and old are deciding it’s time to gather the family for their yearly photography sessions. It's also a great time for High School Senior portraits! We are not upset that it will finally cool down and we are looking forward to the cool autumn breezes. The transition is a photographers dream. The foliage is beautiful, but it is the light. The light during this time of year is warmer and softer than early Summer. The angle of the sun in the Fall creates some of the most unique and beautiful shadows. Now is the perfect time to schedule, before the rush. We want to make sure we can get you in for a photography session. Don’t hesitate to call us at the studio 916-608-9999. 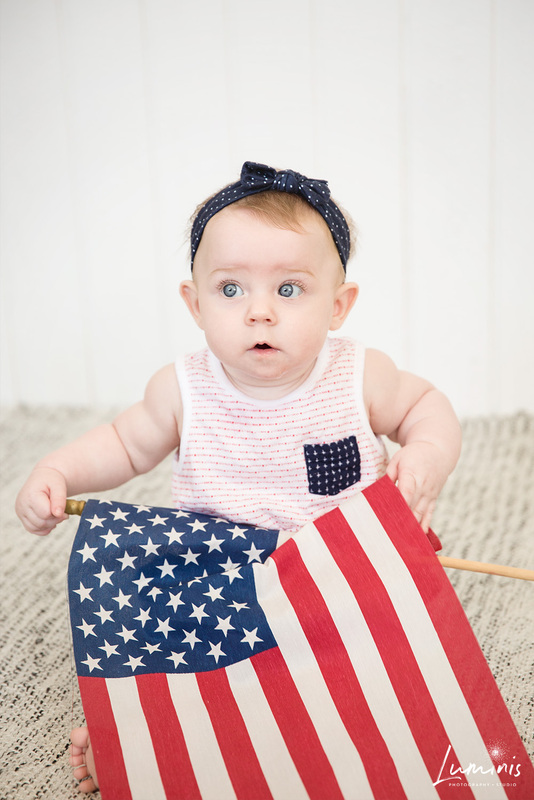 In the meantime, enjoy these adorable patriotic photos of sweet little Lainey girl! Que the "aww's and eeeek she's so cute" comments!